Throughout the Western United States, cool roofs are used to reduce energy costs, prolong the life of traditional roofs and lower roof maintenance costs. Anaheim, CA – Are you interested in reducing your energy costs? Do you want to extend the life of your roof and save thousands over a tear-off and the “unknown factor” once your roof is removed? Then you want a cool roof. All over the globe, throughout the Western United States and especially in the Mid-West, cool roofs are used to reduce energy costs, prolong the life of traditional roof systems and lower roofing maintenance costs. Cool roofs have proven to save on energy costs, especially cooling costs in the hot summer months. But not all cool roofs are created equal. 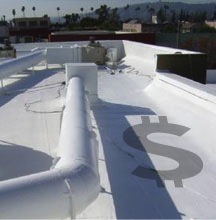 Be careful not to flush your energy saving investment down the “roof drain”. Manufacturers of acrylic roof coatings and silver or aluminum roof coatings DO NOT recommend these products be installed over low-slope roofs with ponding water (water that sits 48 hours after rain). 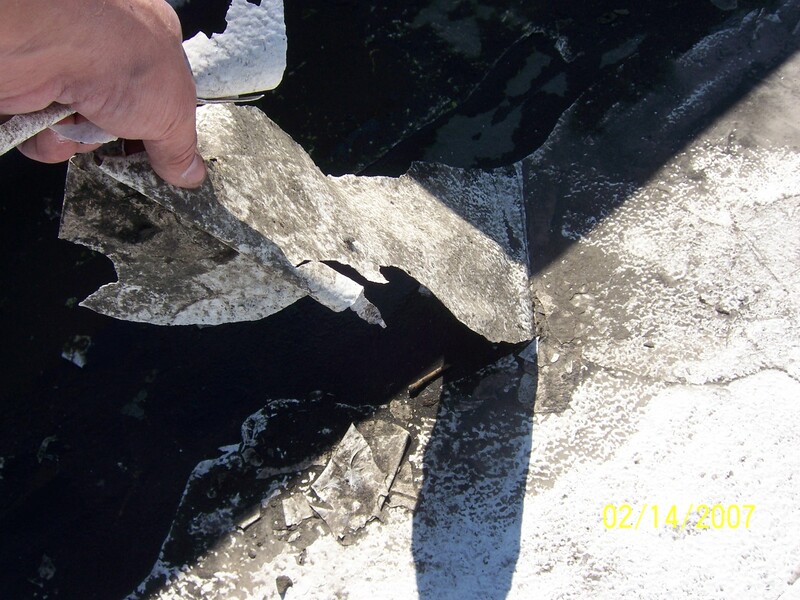 If you are a commercial property owner or commercial roofing contractor, you know that all roofs pond water to some degree. 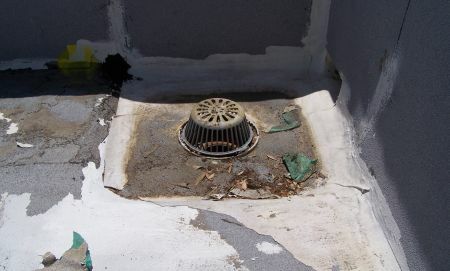 Most commonly these ponding areas are in the drains and waterways and more commonly than not, throughout the field of the roof. Look at the figures below and think about this… How long will your “cool roof” remain a “cool roof”? Typically installed over an emulsion and fiber reinforced base coat, the waterproofing portion of this type of roof restoration system, acrylic cool roof coatings and reflective aluminum coatings just don’t hold up to moisture and UV. 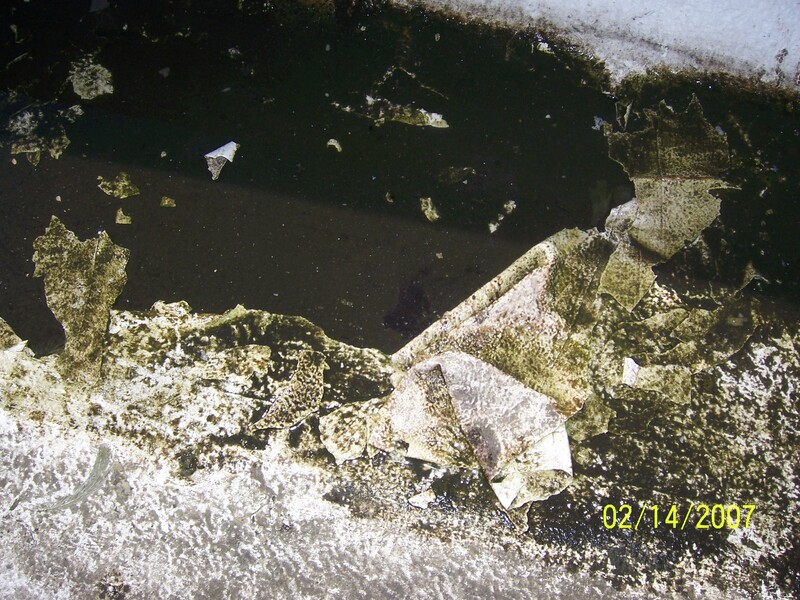 These types of roof coatings can only reflect the UV while they are on the roof. Once they peel, crack and lift, you are left with a hot, heat-absorbing black roof that does not contain any UV resistance. The photos show typical results of acrylic roof coatings, even those used in conjunction with a waterproofing emulsion base coat. The roofs displayed in the photos above were only 6 months to 3 years old at the time the photos were taken. The manufacturers of these coatings specifically state in their installation specification, “not to use in areas where water ponds”. This information was either not passed along to the contractor or ignored by the installing contractor. These emulsion and acrylic roof systems are inexpensive because the materials are inexpensive. However these systems are far from free. The majority of the costs for these types of roofing systems are the labor costs. These systems are not designed to be sustainable cool roofs. Once the white coating or silver coating peels away, the cool roof and all its energy saving, heat emitting values are completely lost. The warranty on these roofing materials claim the roof will be leak free for a period of time but not a cool roof for any period of time. The black emulsion is the waterproofing, not the white acrylic. The reflective acrylic coatings always peel up on commercial low-slope roofs and industrial flat roofs, exposing the emulsion waterproofing. The Ultra-Violet (UV) and thermal protective membrane is gone and the roof is no longer a cool roof. The upside: The SureCoat Roof System is a completely seamless, renewable and sustainable cool roof membrane. A SureCoat Roof will remain a waterproof roof as well as a cool roof for the entire life of the warranty. SureCoat Systems manufacturer’s written material warranty states that “The SureCoat Roof System will not leak due to ordinary ponding water caused by natural precipitation”. Since the SureCoat Roof is a solid core of a single material, as the roof wears, the heat emitting thermal values and UV reflective values remain throughout the life cycle of the roof. When a SureCoat Roof becomes dirty, a simple cleaning with SureSkrub, a biodegradable cleaner, will turn a SureCoat Roof bright white again which will recapture nearly all the initial reflectivity. You cannot scrub any other coating system without it lifting as shown in the pictures below. The thermal heat emitting values of a SureCoat roof always remain exceedingly high at 93%, creating a Solar Reflective Index (SRI) of 102 after aged and dirty. SureCoat was engineered for large commercial low-slope roofs and large industrial flat roofs that pond water, as all large low-slope roofs pond to some degree. DON’T LET THIS HAPPEN TO YOU… PROTECT YOUR ASSETS AND YOUR INVESTMENT WITH A PRODUCT THAT YOU ARE SURE ABOUT. FIELD TESTED AND MOTHER NATURE APPROVED! This entry was posted in Energy Savings - Cool Roofs, Featured Articles, Monthly Newsletters, The Science Behind it and tagged California, Construction and Maintenance, Cool roof, Cool Roofs, Engineering, EPDM rubber, Flat roof, Los Angeles, Manufacturing, Oklahoma, Ponding, Roof, Roof coating. Bookmark the permalink. Would this kind of roofing count as foam roofing? I want to look into getting some, but I’m not sure if it’s the smartest option. I like the way you describe your product too though, so if they’re different I might choose to get the SureCoat roof. Hi there, a SCRS is not a foam roof but it was created nearly 20 years ago to take the place of 2-part urethane for foam roofing over cold-storage. This is a more simplified application than urethanes and waterproof unlike acrylics often used these days over SPF roofing. Call us anytime for information and samples 877-823-7873. Saving money is always a big topic. I think that having a lower maintenance is vital to a good roof. I only usually worry to check the roof if there is a problem. So anything that won’t degrade is important. Thanks for sharing some ideas. Yes saving money is a BIG topic in sustainable construction especially and protection from degradation is of extreme importance in this day and age. You are welcome, thank you for the comments.